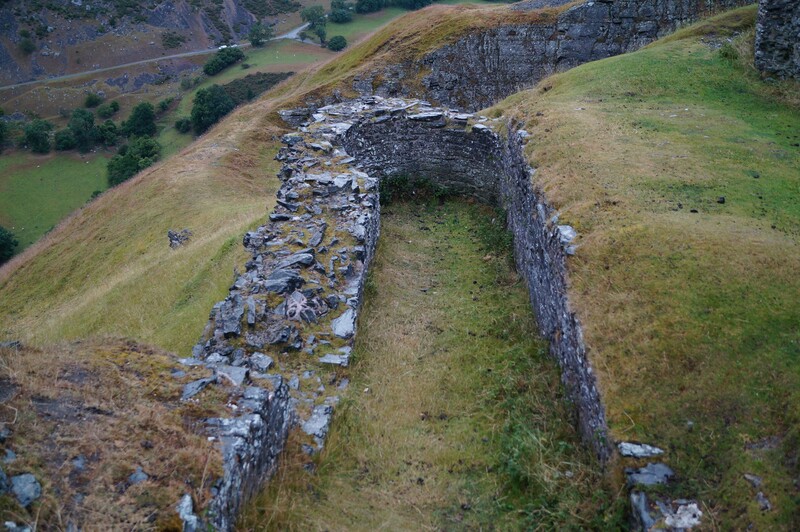 Castell Dinas Brân was built in the thirteenth century on the site of an Iron Age fort. It occupies a formidable defensive position and, during the First War of Welsh Independence, was described as the ‘strongest castle in Wales’. Nevertheless it was abandoned then burnt by the Welsh before English troops arrived and was never rebuilt. 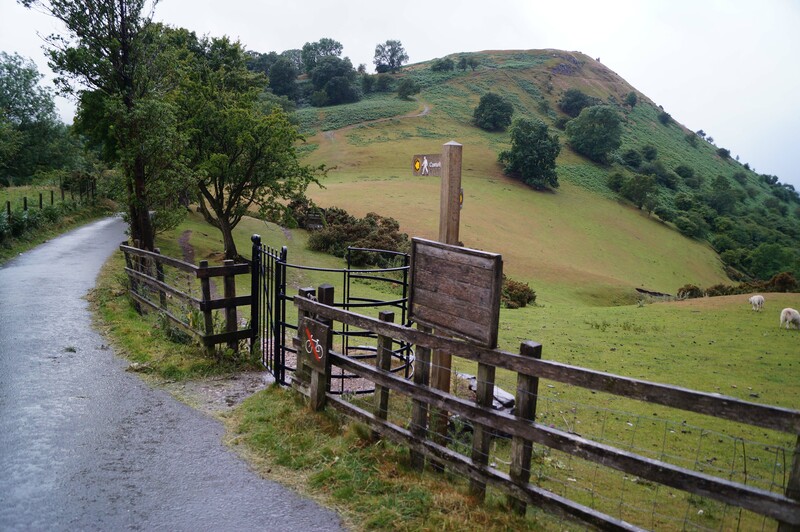 Castell Dinas Brân occupies a formidable position on the summit of a steep hill in the Vale of Llangollen. 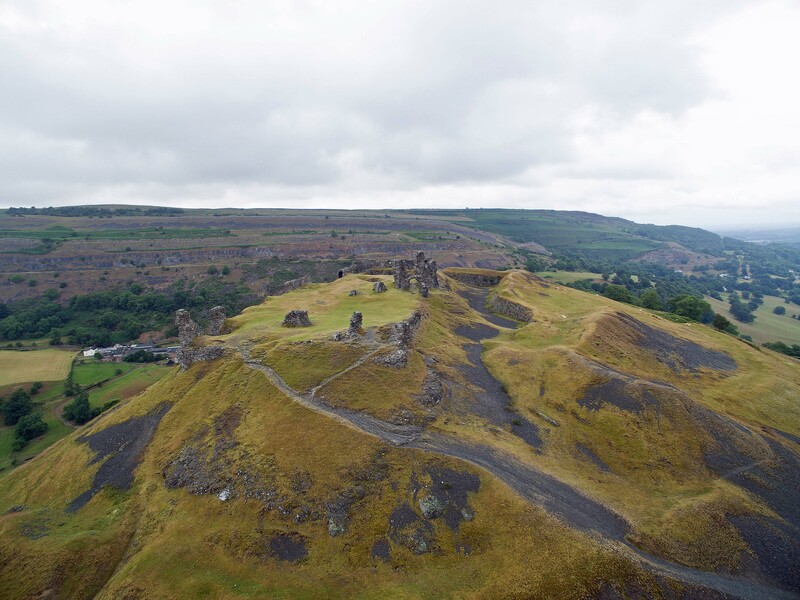 The site has been fortified since at least the Iron Age and probably long before and it also has a place in Welsh legend as the stronghold of Bran, a Celtic deity. However, the early fortifications have largely been obliterated by a medieval castle built in the mid-thirteenth century. 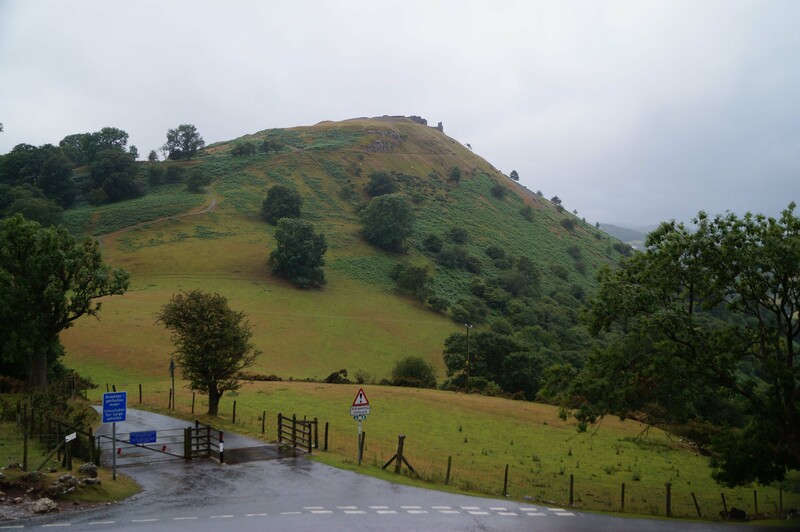 At this time Dinas Brân formed part of the Princedom of Powys Fadog which was ruled by Madog ap Gruffudd Maelor. Upon his death in 1236 his vast estates were divided between his four sons with Dinas Brân passing to Gruffudd Maelor. It was he who built the castle during the 1260s replacing whatever structure, most likely some form of Royal Palace or Hall, preceded it. The castle was dominated by a rectangular two storey Keep built upon the highest part of the hill fronted by a defendable fore building. Extending to the west was a rectangular bailey enclosed by a substantial curtain wall. 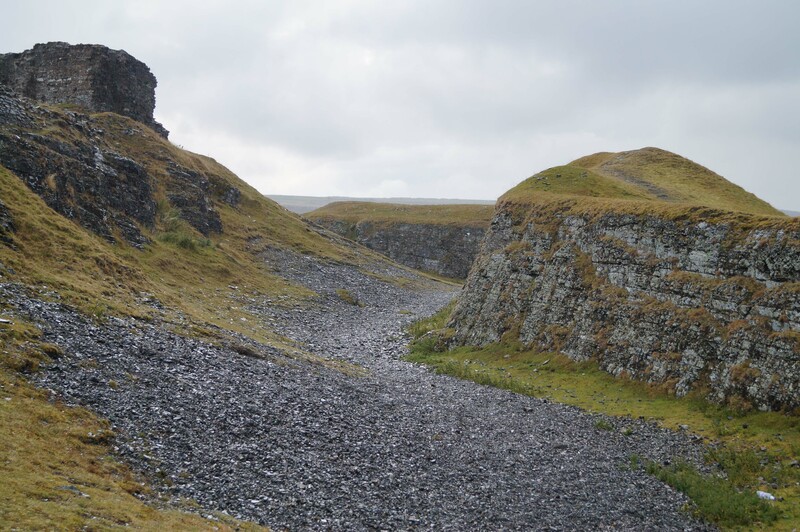 A deep ditch cut out of the rock surrounded the bailey on all sides except the north where the steep natural scarp made it superfluous. The only access over the ditch was via a long wooden bridge which lead to a twin drum gatehouse sited adjacent to the Keep. A 'D' shaped tower was added to the southern face of the curtain wall. Internally the most substantial building inside the castle would have been the Great Hall which occupied the southern end of the courtyard. 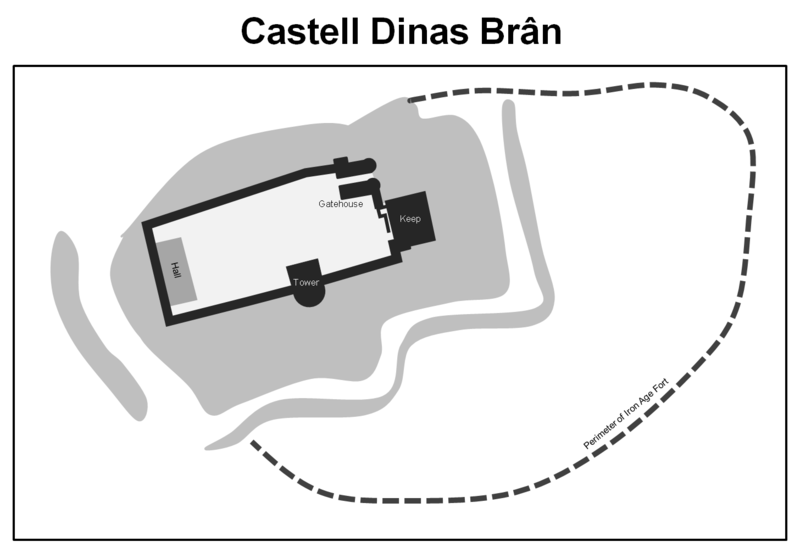 The layout of Dinas Brân is similar to Dolforwyn Castle, which was built around 1273, and may have influenced the design of that fortification. Gruffudd Maelor died in 1269 and the castle passed to his son, Gruffudd Maelor II. He supported the Welsh cause during the First War of Welsh Independence (1276-77) but he ordered his garrison to abandon and burn Castell Dinas Brân rather than attempt to hold it against the English forces. When Henry de Lacy, Earl of Lincoln arrived at the site he found just smouldering ruins. Nevertheless he was impressed with the structure he saw noting "there is no stronger castle in Wales, nor has England a greater [one]". The King was clearly unmoved by this description for the advice was ignored. The site was later granted to John de Warenne, Earl of Surrey but he opted to build Holt Castle to serve as his regional stronghold rather than rebuild the windswept castle at Dinas Brân. Castell Dinas Brân is sited upon a steep hill overlooking the Vale of Llangollen. Although in ruins, some portions still stand to an impressive height. Castell Dinas Brân. 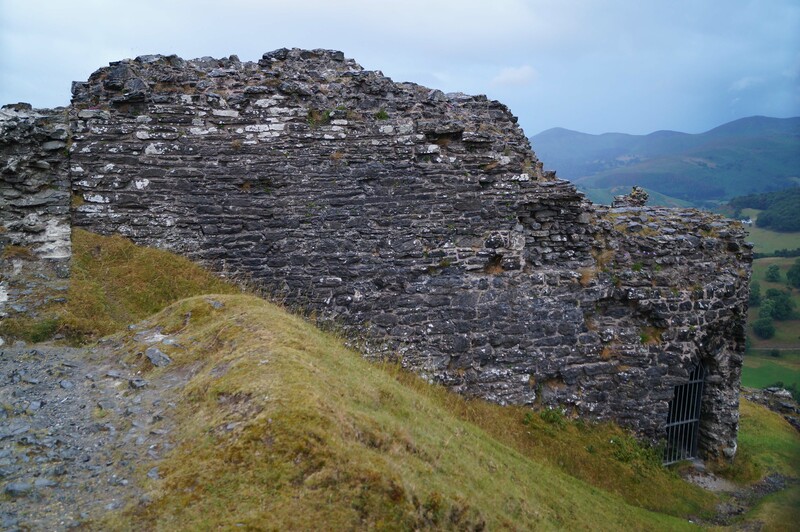 The castle occupies the summit of a steep hill that was originally occupied by an Iron Age hillfort and by the thirteenth century a hall or palace had been established on the site. The castle seen today dates from the 1260s and consists of a Keep, built upon the highest part of the hill, and a rectangular bailey. Castell Dinas Brân Access. The castle occupies the summit of a hill which stands over 300 metres above sea level. Gatehouse. The castle was entered via a narrow, double-drum gatehouse. Today only foundations survive. Keep. The Keep was a two storey structure with a vault or storage area on the ground floor and a hall above. The castle's walls were built of mudstone quarried from the deep ditches. Ditches. The castle was surrounded by deep ditches hewn out of the hill. Castell Dinas Brân is found to the north of Llangollen off Wern Road. On-road car parking is possible with care. The walk to the summit is sign-posted but note it is relatively steep and strong footwear is recommended.